Seventh Annual Unity Luncheon to Celebrate Martin Luther King Jr.
A scholarship started as a tribute to the two photographers killed in the tragic airline crash in Kirksville more than two years ago has received a substantial boost. Alicia Talley, the widow of Paul Talley, recently made a gift of $90,000 to add to the endowment of the Paul Talley and Matt Johnson Memorial Scholarship at Truman. Talley and Johnson were among 13 people killed aboard a commuter plane crash on Oct. 19, 2004 near Kirksville. They were part of a team assisting Truman with the creation and design of new University publications and traveling to campus for a photography session. The fund was created in the fall of 2004 with gifts from Truman’s faculty and staff, Foundation Board of Directors, and Creative Communication of America. The endowment now exceeds $105,000, and is expected to eventually produce $5,000 in annual awards to deserving students. Criteria for the scholarship require the recipient to show potential for academic achievement and leadership qualities. 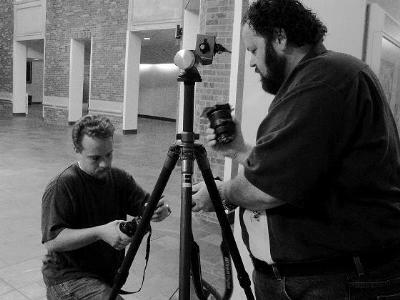 Students pursuing a career in commercial photography, photojournalism or art are given first priority. The scholarship is administered through the Truman State University Foundation. The Multicultural Affairs Center will be sponsoring several activities to honor the legacy of Martin Luther King Jr.
“MLK: The Man, the Movement, the Legacy,” the Unity Program, will kick off the events at 3 p.m. Jan. 15 in Baldwin Auditorium. This program will reflect on King’s tireless work for justice and encourage participants to strive for goodwill toward all humankind. Truman will host the seventh annual Unity Luncheon in honor of King at 11:45 a.m. Jan. 17 in the Student Union Building Lounge on the Truman campus. The centerpiece of the luncheon will be 20 minutes of black music and poetry presented in a cabaret setting. Jazz flutist Galen and his quartet will perform. Galen, originally from Montclair, N.J., is a major entertainment figure on college and university campuses across the nation. He has performed both domestically and internationally for more than 30 years. Doors will open at 11:30 a.m. The luncheon costs $7.50 per person for general admission. Truman students who have a meal plan may attend for $3.50 and one meal block. R.S.V.P. by 5 p.m. Jan. 12 to the Truman State University Public Relations Office at 785.4016. The Martin Luther King Jr. Statewide Commission, Multicultural Affairs Center at Truman, Student Senate and Sodexho are providing financial assistance for the luncheon. The events continue with the Unity Concert at 7 p.m. Jan. 17 in the Student Union Building Activities Room. This jazz and poetry slam in honor of King will include a variety of musical selections performed by Galen. “MLK: From Dream to Reality” will take place at 7 p.m. Jan. 18 in the Student Union Building Activities Room. There will be insight and reflections of King and how his mission of equality has affected the world as people know it today. Refreshments will be served. These events are sponsored by the Multicultural Affairs Center. Contact Laura Bates at lbates@truman.edu or at 785.4142 for more information. In addition, the Multicultural Affairs Center has a table in the Student Union Building inviting students, faculty and staff to donate a penny for everyday of the year. The donations will go to the Martin Luther King Jr. scholarship fund and memorial fund. This fund-raising event will take place from 11 a.m.-3 p.m. now until Jan. 20. Contact Mu Kupara at 785.4142 for more information. 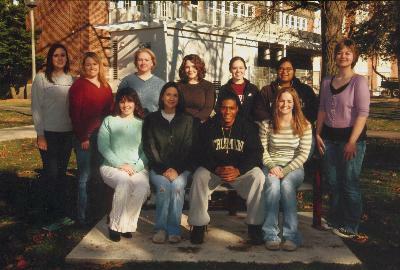 Students who were awarded Foundation scholarships for the spring 2007 semester include (pictured front row, left to right) Danielle Shelley, Pam Stanley, Albert Coker and Laura Harp (back row, left to right) Emmie Combes, Melissa Tennyson, Sarah Shores, Tracey Blasingame, Taylor Wysocke, Katherine Hernandez and another student. Justin Junkel, Gregory Wisa, Lesley Hopke, Emily Null, Jessica Ponder, Nohemi Alvarez, Kenneth Capps, Erika Alexander and Nicholas Kremer are not pictured. The Truman State University Advancement Office recently announced the recipients of the Spring 2007 Foundation Scholarships. These scholarships are made possible through generous contributions from alumni, parents and friends of the University. Six scholarships were awarded for the first time, including Howard & Anne Elsberry Opportunity in Business Scholarship, Dr. Mary Giovannini Scholarship, Edward and Marietta Jayne Pre-Law Scholarship, Tricia M. Mason Chemistry Scholarship, UHY Advisors Accounting Scholarship and Dr. Betty Jo White, D.O. Scholarship. Details about these scholarships and others are available at http://www.truman.edu. Click on Current Students /Foundation Scholarships. More than $464,000 will be awarded by the Truman State University Foundation for the 2007-2008 academic year. Applications for upperclassmen will be available on Jan. 18 at https://secure.truman.edu/isupport%2Ds/scholarships.asp. For more information, contact the Office of Advancement at 785.4133 or e-mail bpike@truman.edu. The Student Union updated their reservation system during the semester break. The present reservation Web site will also be revised, and users will need to set up an account to access the system. The new Web site’s address is http://emspro.truman.edu. Once the account has been established users will need to enter their password each time they return to the site. These changes took place the week of Jan. 2-5. Please bear with the Student Union staff as they work to make the system better and more user-friendly. If you have any questions or comments, please contact the Student Union Office, 785.4186. Cynthia Cooper, professor of biology, was recognized at the American Society of Microbiology’s Conference for Undergraduate Educators for successfully completing a yearlong residency program to improve student learning in the microbiological sciences. The program brings together outstanding faculty committed to investigating and documenting significant issues and challenges in the teaching of microbiology. Cooper was one of 16 microbiologists who completed the program. The program objectives are to: 1) improve student learning in the microbiological sciences, 2) develop a cadre of leader teacher scholars, 3) enhance microbiology faculty members’ professional development, and 4) support a community of scholarly work. Cooper studied how service learning in the Introductory Microbiology class impacted student learning. The service project involved having each student take part in a water quality analysis that served community partners in Linn and Sullivan counties. The residency program began in July 2005 at a four-day institute on the Scholarship of Teaching and Learning (SoTL) at ASM headquarter office and culminated with a presentation about the work at the ASM Conference for Undergraduate Educators in Orlando, Fla., on May 19-21, 2006. Throughout the residency, the Scholars developed their understanding about learning science in college classrooms. Students interested in a part-time job this semester are encouraged to apply to work with the Tel Alumni campaign. Tel Alumni is hiring between 20-30 students to work for 11 weeks. Tel Alumni offers nightly prizes including items such as gift certificates, clothing and food; a relaxed, fun work environment; paid training; a flexible schedule and an hourly institutional wage of $6.50. Scholarship and work study positions are also available. Tel Alumni is an excellent résumé builder for students majoring in fields such as business and/or communication. Students may pick up an application in the Advancement Office, McClain Hall 100. The application deadline is Jan. 22. Forty-five Truman students will be recognized in the 2006-2007 edition of “Who’s Who Among Students in American Universities and Colleges” for their academic achievement, character, leadership and service. The students will be recognized for their achievements at a luncheon from noon to 1:30 p.m. Jan. 27 in the Student Union Building Lounge. The following students will be recognized: Kelsey Aurand, Jyoti Bastola, David Bonner, Matthew Brawner, Katy Browning, Ashley Coleman, James Cruse, Emily Doucette, Kevin Dyke, Samuel Edeh, Erica Flanagan, Courtney Floro, Emily Forsyth, Jeremiah Gitiha, Jennifer Glass, Rebecca Hanania, Megan Hasse, Kristen Hohmeier, Tanya Horvath, Jennifer Huang, Chizoba Ifeorah, Michael Jones, JoAnn Jorgovan, Idean Judah, Erin Kane, Robert Kelchen, Kiran Khadka, Ryan Lewis, Daniela Manikatova, Dorothy Matta, Jill Moeller, Melvin Omodon, James Perry, James Quigley, Natalie Schupbach, Jason Simpson, Starr Skinner, Heath Smith, Maria Spilker, Dobromir Stoyanov, Paul Strauss, Silviya Valkova, Kathleen Warrington, Sunjuka Warusavitharana and Molly Wenberg. Google has announced the Anita Borg Memorial Scholarship for the 2007-2008 academic year. A group of female undergraduate and graduate students will each receive a $10,000 scholarship. The candidates must be enrolled full time, majoring in computer science, computer engineering or related technical field, and maintain at least a 3.5 grade point average. For details, visit http://www.google.com/anitaborg/. Deadline for application is Jan. 15. Glamour magazine is sponsoring a 2007 Top 10 College Women Competition. Winners receive a $2,000 cash prize, a trip to New York City, opportunities to meet with top female professionals and national recognition in Glamour’s October 2007 issue. Applicants must be full-time juniors for the 2006-2007 academic year and have leadership experience, involvement on campus and in the community, excellence in their field of study and unique, inspiring goals. Applications must be received by Feb. 12 and are available online at http://www.glamour.com. The Truman State University chapter of Phi Kappa Phi would like to announce the competition for the 2007 PKP Graduate Fellowship. Every year, the Honor Society of Phi Kappa Phi awards 60 Fellowships of $5,000 each and 40 Awards of Excellence of $2,000 each to members entering the first year of graduate or professional study. Last year, Elizabeth Bobzien was selected for a Fellowship as a representative of Truman State University. To apply for a Phi Kappa Phi Fellowship, students must be an active member of Phi Kappa Phi (annual dues paid by March 31, 2007) or have accepted membership by June 30, 2007. Students also must have applied and been accepted as a full-time student in a post-baccalaureate program of study for the 2007-2008 academic year, preferably at an accredited American institution of higher learning. Complete application packets should be submitted to Truman’s Phi Kappa Phi chapter no later than Feb. 1. Students registering in all professional and graduate fields are eligible. Applicants who have already earned credit for a full term of graduate study or its equivalent before the 2007–2008 academic year are not eligible. To obtain application materials, download the application packet (using Adobe Acrobat Reader) at http://www.phikappaphi.org. Students may complete the application online, print it out, and submit it with the other required materials to the Truman chapter. Any questions about this should be directed to Wynne Wilbur, wwilbur@truman.edu or at 785.4435. The Truman State University chapter of Phi Kappa Phi announces Study Abroad Grants for the 2007-2008 school year. These grants are designed to help support undergraduates as they seek knowledge and experience in their academic fields by studying abroad. Applicants do not have to be a member of Phi Kappa Phi, but should have a minimum of 30 semester hours and no more than 90 semester hours by Feb. 15, and a grade point average of 3.5 or higher to apply. Students must also have been accepted into an accredited study abroad program before the application deadline. Study abroad should take place between May 1, 2007, and June 30, 2008. The completed application and supporting materials (original plus five copies) must arrive at the Society Headquarters on or before Feb. 15. Any questions about this grant should be directed to Wynne Wilbur, wwilbur@truman.edu or at 785.4435. Due to technical issues beyond our control (including two shipments of defective card stock from our ID card supplier during the past month), we are unable to produce the new Truman ID cards. The ID Office will not be exchanging ID cards in January as previously announced. Please retain your current Truman ID card. Sodexho, Pickler Memorial Library and the Student Recreation Center will continue to accept your current Truman ID card in January. The US Bank ATM/debit card functionality will not be available until we are able to provide you with a new Truman ID Card. New dates for the card exchange will be announced at a future time. We apologize for any inconvenience this may have caused you and appreciate your understanding and cooperation. The ID Office is open normal hours, 8 a.m. to 5 p.m. If you have any questions, contact Kaye Davis, ID coordinator, at 785.4123. KTRM, 88.7 The Edge, a member of the Truman Media Network is now on air 24/7 throughout the entire year. Viewers can listen to KTRM when watching campus channel 36. An invited essay by Adam Brooke Davis, professor of English and interim director of interdisciplinary studies, appears in “Approaches to Teaching Chaucer’s Troilus and Criseyde and the Shorter Poems,” ed. Tison Pugh and Angela Jane Weisl, published by the Modern Language Association (N.Y., 2006). “Diverse Folk Diversely They Seyde” explores the problems of teaching Chaucer to non-specialists. Taner Edis, associate professor of physics, gave a talk titled “Religion: Accident or Design?” at the International Conference on the Evolution of Religion in Hawaii, Jan. 3-8. John Ishiyama, professor of political science and director of the McNair Program, had his article “Nominations and Party Development in Ethiopia: The Opposition and the 2005 Parliamentary Election” accepted for publication in African and Asian Studies. Jack Magruder, president emeritus and professor emeritus of chemistry, has been appointed to the advisory committee for the Missouri Foundation for Health. The Foundation was created in January 2000 as part of a negotiated agreement between Blue Cross/Blue Shield of Missouri, the Missouri Department of Insurance and the Missouri Attorney General. Today, it is the largest health care foundation in the state with assets of $1.29 billion. It is among the largest of its kind in the country. Judy Mullins, controller, continues to serve on the Audit Committee of the Central Association of College and University Business Officers (CACUBO). CACUBO is a nonprofit association representing chief business officers at more than 700 institutions throughout the North Central region of the United States. Tim AuBuchon, assistant professor of music and director of jazz studies, will present a program at the Truman Faculty Forum titled “How to Listen to Jazz” at 7 p.m. Jan. 18 in Magruder Hall 1000. A reception with refreshments will follow. Students, faculty, and the public are invited to attend the presentation.